I moved to New York City in the summer of 1995 after finding a tiny sublet in SoHo I could afford. One hot evening I was sitting on the floor working at my desk (a board elevated by cinder blocks on either end). I was using a computer program to balance my checkbook when I swiftly and inadvertently deleted two years of financial records. All the data I’d painstakingly entered each month was gone. There was no effective “undo” option to correct the error. As I frantically attempted to retrieve the files to no avail, the small apartment suddenly seemed smaller . As I made my way to the exit I stopped before a bookshelf near the door. Though still alarmed about the files being deleted, I’m ever alert to books, like a pigeon to breadcrumbs. The fiction stacks, my customary haunt, were in the rear of the shop. Here in the front was a Judaica section. Resting horizontally on top of wider bindings was a pocket-size book, hardly larger than a postcard folio. I lifted it from its perch. 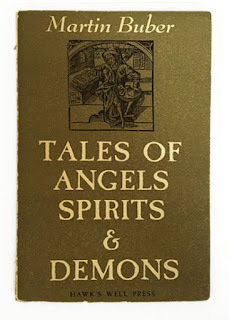 Its cover was moss green, made of a heavy, uncoated, cottony paper stock. A quiet book. It fit my hand. 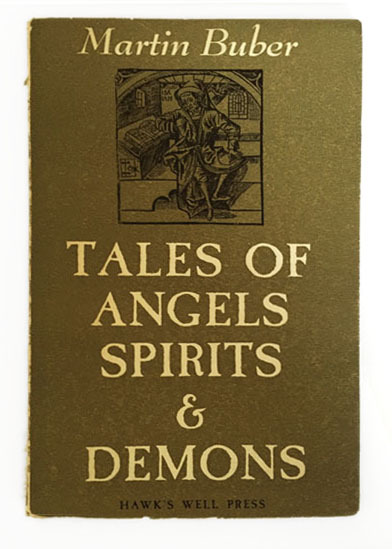 Tales of Angels, Spirits & Demons by Martin Buber. I like Buber’s writings and opened the book. As I began reading it was like entering a verdant forest. I stayed no longer in the bookstore. I bought the book without hesitation and headed outside with lingering panic about the technological failure on my mind, the book of Buber stories in hand.